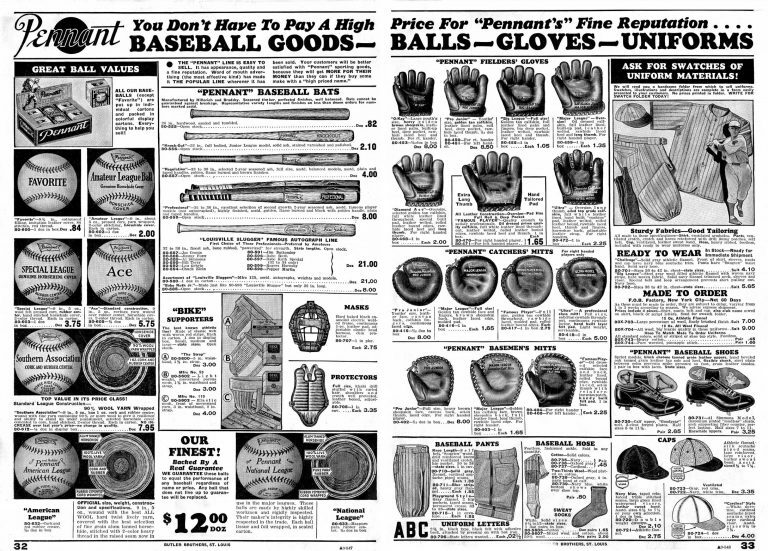 Everything you needed to play the Great American Pastime could be found on this oversized double-page spread – bats, balls, gloves, uniforms, masks, even athletic supporters (the dreaded “jock straps” of my youth.) Prices listed are wholesale, so the local retailer – a general store perhaps, or sporting goods, or druggist – could mark them up. Zoom for the many details. As a sport, baseball in the 1930s was a national obsession in a way that was probably unmatched in America’s history. Football and basketball were small potatoes. Every summer, everybody followed baseball – in person, on the radio, in the newspapers. From the biggest franchises, to the minor leagues, to regional teams, to Little Leagues and the regular kids on the corner lot, it was the only game that mattered. And having the right equipment was important, from uniforms, to gloves, even bats and balls. Butler Brothers offered a selection at a range of prices appropriate to a country working it’s way out to the depression. And the bats – if you could afford it, there was magic to the names burned into the Louisville Sluggers: Gehrig, Ruth, Hornsby and others. No wonder those wholesaled for $21 per dozen. A regular bat could be had for 90% less. But if you hefted a “Babe Ruth” bat, who knows what might happen? You can still buy Babe Ruth bats today – vintage or new, and they still command a premium. Butler Brothers, by the way, was based in St Louis, a town quite proud of their TWO major league baseball team – the Browns and the Cardinals. The Browns finished 7th that year, and the Cardinals finished 2nd.